Our new CamBar B2 shows three of the characteristics we value most at AXIOS 3D® Services. 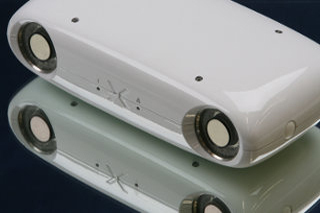 The next generation CamBar is an optical stereo tracking system. Its versatility and the spectrum of possible applications make it a flexible companion whether it is used in industrial applications or in medtech. CamBar B2 is approved as medical device. Even when leaving the hightech features guaranteeing precision and high accuracy aside, one advantage becomes obvious at first glance: the compact size. CamBar B2 effortlessly fits on a lettersized sheet, thus maximizing mobility and portability. Connect several tracking systems via a network interface to individually optimize measurement volume and accuracy. Developers working with CamBar B2 can directly access image data of the 3D tracking system’s cameras. This allows easier monitoring of environmental conditions potentially interfering with tracking and measurement. This open approach assists developers and end users of AXIOS 3D® tracking systems in trouble shooting and quality control. CamBar B2 is available in the variations S, M and L. Depending on the variation, a small, medium or large measuring volume is available. Accordingly, the minimum and maximum measuring distance depend on the chosen variation of the 3D measuring system. Further configuration options are based on the markers to be tracked. The optical 3D tracking system can be configured to either measure retroreflective spherical or flat target markers or markers such as boreholes, inkjet markers or laser engravings. This results in a myriad of application options in industrial quality assurance, material – and tool positioning or navigation in computer assisted surgery. CamBar B2 is a compelling combination of brilliant design and precise optical 3D measurement technology.